Packaging Details Height Width Depth Weight 7.04" 4.12" 4.12" 33.7 oz. Details The ultimate training pak. The hard line in sports nutrition. 44 Scientifically balanced packets containing: » Mega vitamins and minerals. » Performance nutrients. » Amino acids. 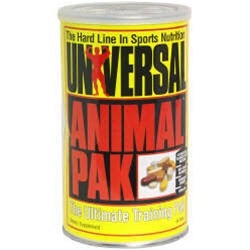 Nothing comes close to Universal's Animal Pak, the Ultimate Training Pak. There's no better nutritional weapon to fuel intense workouts than Animal Pak. Pro bodybuilders, elite powerlifters and world-class athletes swear by the Animal Pak for the following reasons: » Enhanced endurance. » Increased energy. » Protein metabolism. » Anabolic nutrients. » Optimum results. Loaded with the most advanced and highest quality bodybuilding nutrients, Animal Pak is still light years ahead of any other formula. Only Animal Pak provides you with the perfect combination of complex proteins, mega-vitamins, lyophilized amino acids and essential training factors (such as inosine, choline, PAK, Protogen A, PABA, and carnitine). Each pak also contains a powerful combination of vital mineral complexes, lipotropics, digestive enzymes, BCAA's, essential fatty acids, and high potency pre-workout energizers, synergized in a perfectly balanced, time-released formula of eleven tablets. If you're serious about your body, don't settle for anything less than the Animal Pak. It will blast your body with all the nutrients you require. Train like an animal. Train with Animal Pak. Nothing works like it in the world. Contains no sugar, starch, artificial preservatives or colors. (These statements have not been evaluated by the Food and Drug Administration. This product is not intended to diagnose, treat, cure, or prevent any disease.) Directions Recommended Use: As a dietary supplement, take one pak thirty minutes after the meal prior to your workout with plenty of water. For competitions and intense training, take two packets daily.